Rabbi at Salonica, who died in 1722. 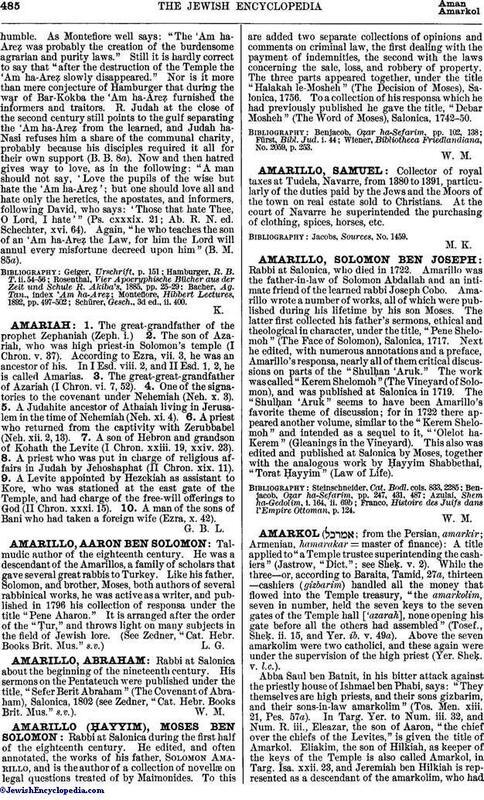 Amarillo was the father-in-law of Solomon Abdallah and an intimate friend of the learned rabbi Joseph Cobo. Amarillo wrote a number of works, all of which were published during his lifetime by his son Moses. The latter first collected his father's sermons, ethical and theological in character, under the title, "Pene Shelomoh" (The Face of Solomon), Salonica, 1717. Next he edited, with numerous annotations and a preface, Amarillo's responsa, nearly all of them critical discussions on parts of the "ShulḦan 'Aruk." The work was called "Kerem Shelomoh" (The Vineyard of Solomon), and was published at Salonica in 1719. The "ShulḦan 'Aruk" seems to have been Amarillo's favorite theme of discussion; for in 1722 there appeared another volume, similar to the "Kerem Shelomoh" and intended as a sequel to it, "'Olelot ha-Kerem" (Gleanings in the Vineyard). This also was edited and published at Salonica by Moses, together with the analogous work by Ḥayyim Shabbethai, "Torat Ḥayyim" (Law of Life). Franco, Histoire des Juifs dans l'Empire Ottoman, p. 124.